When you are too close to the problem and working hard every day, it is extremely difficult to take a step back and look at things from a high-level perspective. Use my expertise to break through your brand builder barriers! Add on time to implement your ideas with marketing messages, websites, graphic design & more! Expert insight & brainstorming to get more clients with a shorter TO-DO list! Refine ideas & gain clarity to determine your next step forward. Prioritize your marketing & business plans…move ahead, pause or stop? Outside perspective to quickly filter numerous options. Brainstorming to help you “think out loud” & narrow your focus. Help early in the process to get feedback BEFORE you take action. Get a second opinion or professional critique of your marketing. Review your brand from your ideal client’s perspective (not yours). What do I think of your website or marketing materials? What other suggestions do I have? What are the pros / cons of specific marketing tactics? What DIY or cost-effective options may work for you? Save time by not having to review multiple options yourself. Get recommendations and learn what to avoid. What marketing strategies & pitfalls should you be aware of? Fast-forward your process by avoiding mistakes. Learn lessons from my 23+ years of experience. How can various tech tools & solutions help your business? Tips and hacks to solve common problems or speed things up. What’s really necessary vs. “nice to have” or a total waste? Or get targeted help on a specific topic! An outside perspective will get you unstuck & focused. The Marketing QuickHelp Package will save you time, money & energy! Accelerate your success with support for your questions & specific challenges. Quickly get unstuck by reviewing options to move forward. I have years of experience to fast-forward your brand building process. Get recommendations for marketing, networking, sales, design, websites & productivity. Action guides, checklists & worksheets may be included. Use on your own or get my help. Save your time, money & energy by not having to figure everything out yourself! Need more help with your marketing & brand? Find out how we can work together to support your business growth. Get a custom recommendation of strategy, brand identity, design, marketing & training. Get your outline for the next 90-days and options for future phases. Are you in a constant state of overwhelm because you are investing precious time, money and energy in one-sized-fits-all programs, the wrong business models, random marketing tactics or expensive tech systems & support? As a business owner, you also have many questions about branding, marketing & technology that pop up almost daily. How do you get the answers you need to implement the solution as fast as possible? I also believe that Entrepreneurs can build a successful business from their desired results — a perfect blend of their business plan, passion & lifestyle. But let’s face it, it can be nearly impossible to gather your ideas together & implement on your own. Imagine having a CUSTOM plan, support & guidance to reach the vision you have for your dream business. Working together, you’ll always know your next best step and “course correct” quickly and efficiently to adjust to market changes and opportunities. I am your strategic partner to help you turn goals into action, bring your ideas to life & focus on effective, low-cost marketing strategies (I can also implement them for you!) I’ll guide you through the confusion of building your brand with my expertise in branding, strategy, design, technology and my ability to think outside of the box. I offer personalized 1-on-1 support by phone, email & online training to help you grow your dream business. Business & marketing strategy maps out your fastest path to profits…while reducing your overwhelm! Planning will take things off your TO-DO list and save thousands of dollars & countless hours. My approach zeros in on your strategy FIRST to then make smart, effective branding decisions. Strategy will guide ALL business decisions surrounding your networking efforts online and offline. This includes where you spend your valuable time, your money, whom you need to hire to help you and how you communicate your brand 24/7. Strategic planning will help you make better business decisions that are best for your brand and utilize technology to your benefit, ultimately saving you significant time and money. We highly recommend that your business approach this part of the process seriously and plan for it to be a part of your budget and time allotted for the project. Get more help as needed! This package is designed to get you started on your most urgent challenges. Use Brand Builder Blocks (30-min, 2-, 5-, 10- or 20-hours) or other packages of targeted solutions to get more help with strategy, branding, design or tech setup. This creates a totally customized plan to work with your goals, budget & schedule. Let’s get started to build your brand! YES! 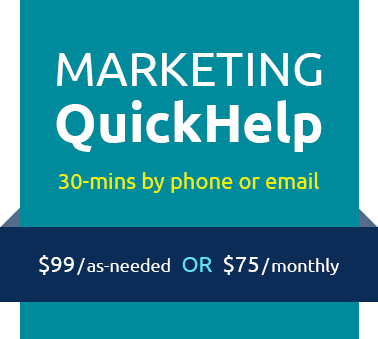 I want the Marketing QuickHelp Package! Need answers & some expert insight? Find out if this package is right for you!